Syrian and Romanian art will be exhibited. Among the featured artists, the exhibition will host 6 Syrian artists. Syrian artist Fadi al Hamwi is present in Bucharest for ”War Correspondence”, main exhibition in Buhcarest Art Week. Although the week is over, the main exhibition remains open until 27th of October 2017 at Palatul Stirbei. Tuesday, 24th of October 2017, starting 12:00, the artist will be present in the gallery, at Palatul Știrbei, ready to talk about the exhibited works, about the condition of artist during the war, his own experiences and the way war influenced his work. Damascene artist Fadi Al Hamwi holds a BA Degree in Fine Arts (2010), major in oil and mural painting, from the Faculty of Fine Arts of Damascus. As a multimedia artist (painting, video, installation), he has participated in numerous solo exhibitions and produced installations in Damascus and Beirut. He joined many collective exhibitions in Damascus, Beirut, Dubai, London, in Canada and the USA. He lives and works in Berlin, Germany. 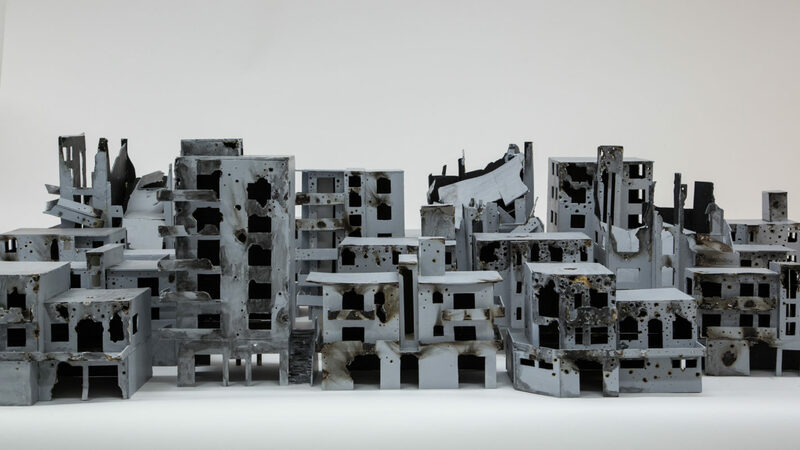 Fadi Al-Hamwi’s body of work shows a preoccupation with translating the human experience of war, rather than producing art with a political message. His art explored the lack of humanity in the Syrian war, exposing men and woman stripped to the structure of their bones. He gives a face to war and has offered a fresh and human perspective on the conflict.